What do assistance dogs and race cars have in common? Top-notch quality. Race car drivers want a vehicle that performs on every turn. People with disabilities need expertly-trained assistance dogs who are up to the task of increasing independence. Now, one driver has gone to the dogs to generate awareness for Canine Companions for Independence®. Kyle Weatherman started his stint in the Automobile Racing Club of America (ARCA) series at age 15. Now 19, Weatherman has secured a victory in every series in which he participated and is moving up from the NASCAR minors aiming for the main circuits at speeds over 200mph. In July, Weatherman made his 50th ARCA career start, with an impressive 25 of those 50 starts ending in top five finishes. On September 14, his car will feature Canine Companions. Fans can follow the rest of Kyle’s amazing season at kyleweatherman.com. 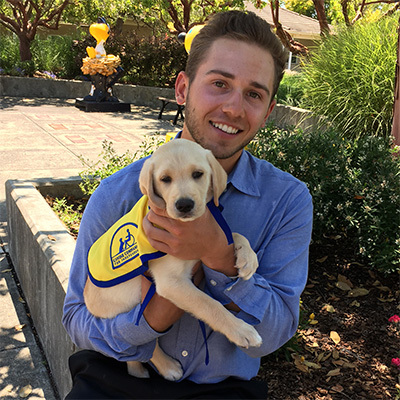 Together, Kyle and Canine Companions are working to Give Independence—and Give a Dog a Job.